No longer support from STM. The X-NUCLEO-IDW04A1 Wi-Fi evaluation board is based on the SPWF04SA module. The SPWF04SA module has an embedded STM32 MCU, a low-power Wi-Fi b/g/n SoC with integrated power amplifier and power management, and an SMD antenna. The SPWF04SA module relies on 2 MB MCU internal Flash. 1 MB of the internal Flash is for storing the user file system and to perform secure firmware update over the air (FOTA). A hardware interface allows the use of external memory to extend file system storage capability with no size limit. The firmware includes a complete IP stack, dynamic web pages with SSI to interact with the module and a REST API (get & post) for conveniently transferring files to and from servers in the cloud. The module can simultaneously behave as a socket server and socket client. The firmware supports secure sockets with TLS encryption, ensuring secure end-to-end communications with the cloud. 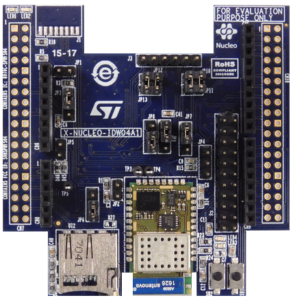 The X-NUCLEO-IDW04A1 interfaces with the MCU on the STM32 Nucleo board via the UART serial port and/or SPI interface. 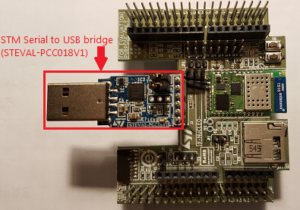 For connect SPWF04Sx evaluation board to the PC, I suggest to use the STM Serial to USB bridge (STEVAL-PCC018V1) see the image below. On PC we use TeraTerm. 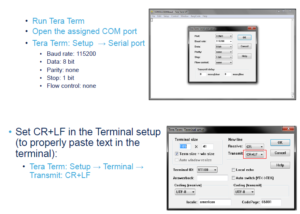 The TeraTerm must be configured as shown below. REPL stands for Read Evaluation Print Loop and it is the std name given to the interactive MicroPython Prompt that is also enabled on SPWF04S. Typically used for debugging purposes, it is by far the easiest way to test interactively the code and run commands. On SPWF04S, AT+S.python command launched without parameters and the CTRL-D escape character are respectively used to enter and to leave the REPL. When the UART console is set on the module a python script can be launched by using the AT+S.python command with the script specified as its parameter. MicroPython scripts are developed using a standard offline text editor, and then moved for execution on SPWF04S Wi-Fi module. 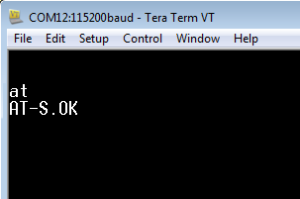 After the script execution, the control returns to the UART AT Console. By using the GPIO(8) set to high at the boot time, or when console_enabled is set to 3, the module automatically enters the execution of the script specified by the configuration variable “python_script”. This mode allows to use the module without a connected host. this means that on following reboot, to access again the python mode, GPIO(8) must be high again. The Figure below summarizes the MicroPython modes described above. This variable is defined to set the console on SPWF04S. This setting allows using MicroPython together with the UART console and by referring to the MicroPython modes it enables both the REPL and the Run time script modes. this setting allows only a MicroPython preloaded script to be executed. No UART/SPI communication is allowed to/from an Host processor when this mode is enabled. To choose the amount of memory to reserve for MicroPython script/REPL execution. The default value is 32 (in unit of 1024 bytes). 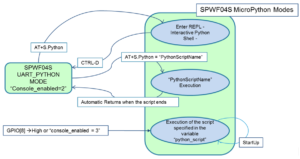 Identifies the script to be executed when console_enabled is set to 3 (PYTHON_ONLY). The default value is “3:/uPython_test.py” (a ROM resident example script). This GPIO has been reserved to enter PYTHON_ONLY mode via HW, no matter console_enabled configuration variable value is set to. If GPIO(8) level is high at startup, than MicroPython script pointed by python_script configuration variable is executed, and AT command/SPI protocol cannot be used. When Micropython is active the GPIO(14), PWR_LED, is driven to make some execution steps visible with a LED connected to that GPIO. See Table below for specific behaviors in the different use modes. This function is disabled when GPIO(14) is used as the MOSI signal in a SPI connection. Note 2. See paragraph 2.2 for a list of possible REPL commands. The PWR_LED is on when the scripts is running. At every reboot the script pointed by the python_script variable is executed.